First thing you will notice about Tarpon Springs, Florida is the abundant array of Greek restaurants everywhere, especially as you get closer to an area called the Sponge Docks. Apparently, Tarpon Springs has the highest concentration of Greek Americans in the U.S., who knew? Greek immigrants were first attracted to the area because of the thriving sponge harvesting industry – and I mean, “real” sponges! Not the plastic multi-coloured ones you buy to scrub your bathtubs. These grow in deep waters and what’s best about them is their natural anti-bacterial qualities! So of course, I had to buy some……ok, enough about sponges and let’s talk food. 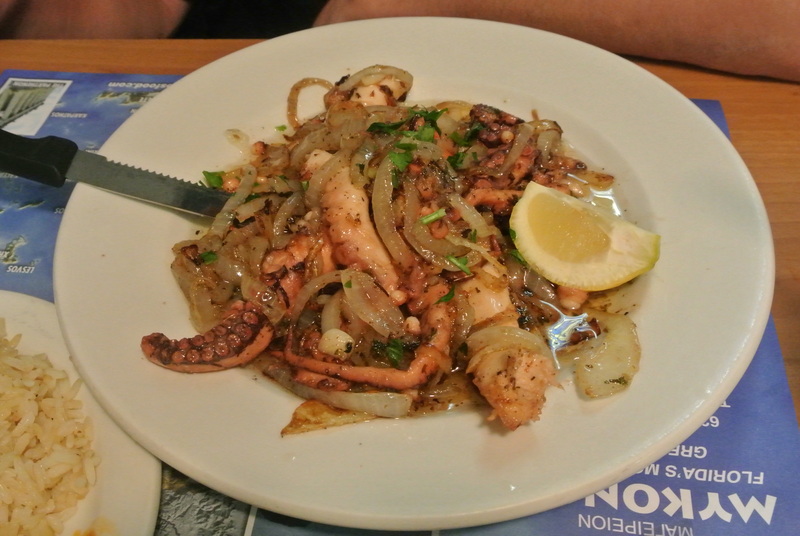 Other than greek home cooking I’ve had when visiting my close friend B’s home, the only greek restaurants I’ve been to are on the Danforth in Toronto (as we know it, Little Greece) so there isn’t a lot of fish and seafood on the menu. Our second night, we ventured to the Sponge Docks and decided to dine at Mykonos. And to my delight, snapper was caught earlier that afternoon and was the special on the menu – whole snapper charbroiled! It came to the table whole showing visible grill marks across its flesh – what a treat! The server de-boned and filleted it right at the table for us. The snapper was so flaky and sweet! 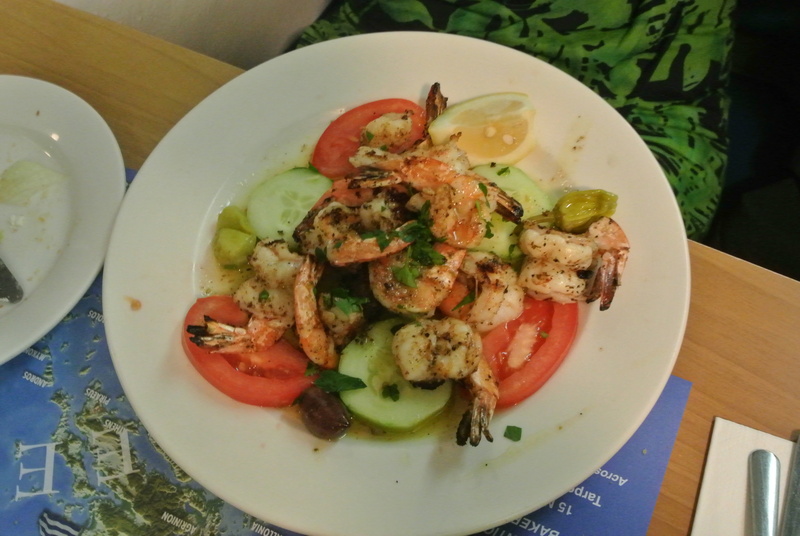 It tasted great on its own and also dipped in some lemon juice and olive oil – such simple but pure cooking. Definitely some of the best seafood I’ve had in a long time! 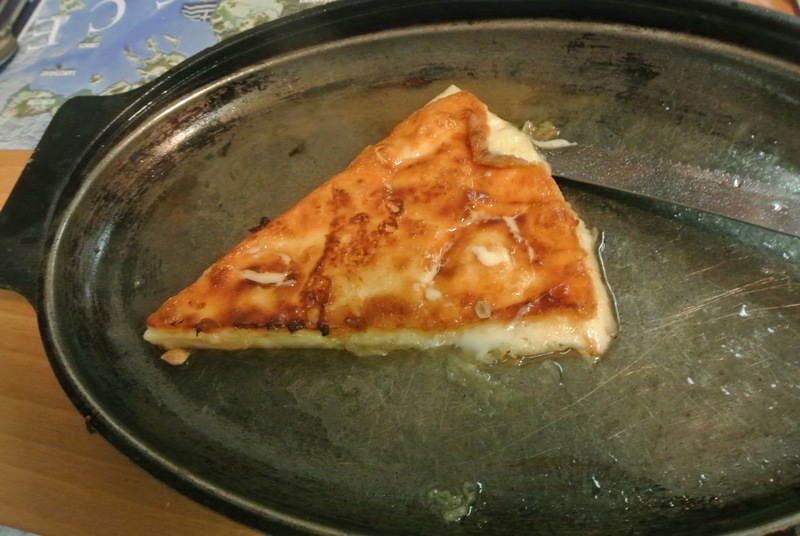 Saganaki after the flames have gone out – salty, creamy goodness! 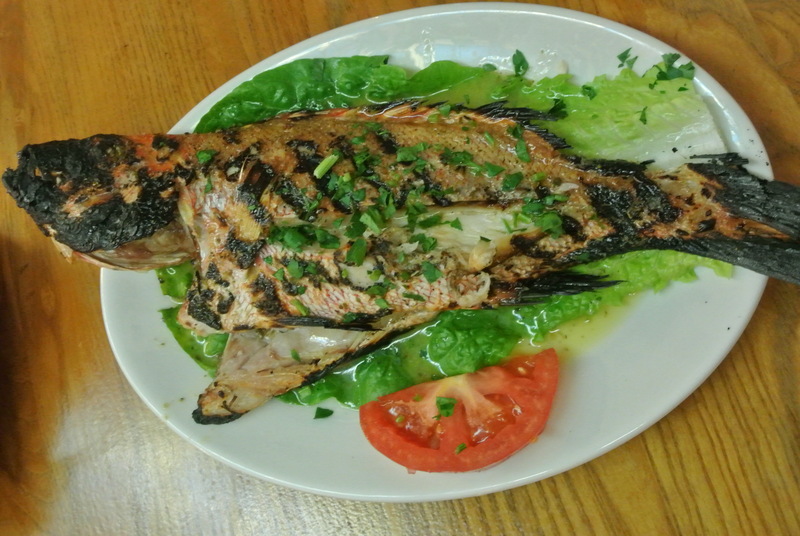 The special of the night – whole fresh snapper caught that day, charbroiled on the grill. 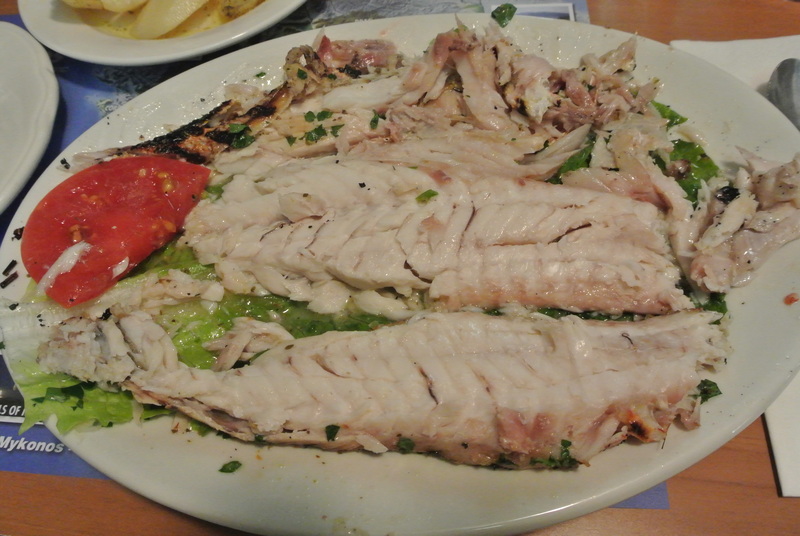 Whole charbroiled snapper de-boned and filleted at the table. 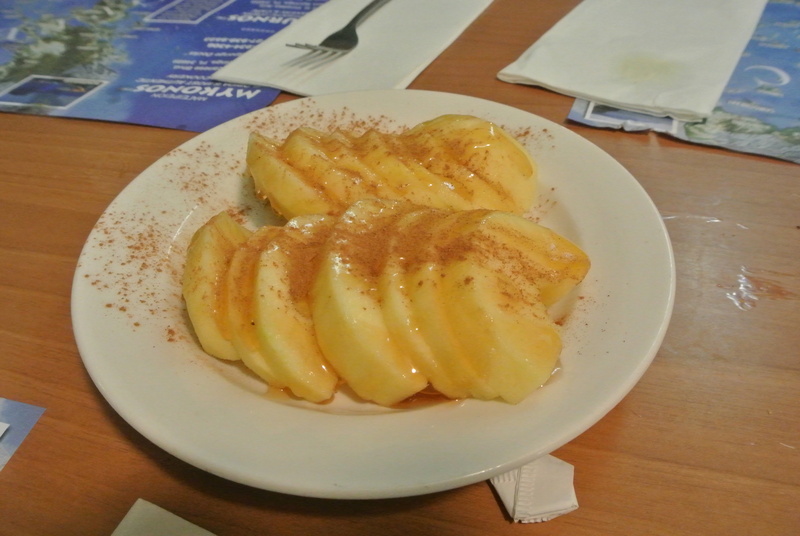 A little dessert to close off the meal – fresh cut apple drizzled with honey and cinnamon. My partner and I stumbled over here from a different page and thought I should check things out. I like what I see so i am just following you. Look forward to looking at your web page yet again.